Lee Jae-yong is facing accusations of bribery linked to a scandal that triggered the impeachment of South Korea's former president. Prosecutors are asking for a 12-year jail sentence. He denies all charges. The case has gripped the public amid growing anger against South Korea's biggest companies, known as chaebols. Why is he on trial? Mr Lee, also known as Jay Y Lee, has been detained since February on a string of corruption charges including bribery, embezzlement and hiding assets overseas. 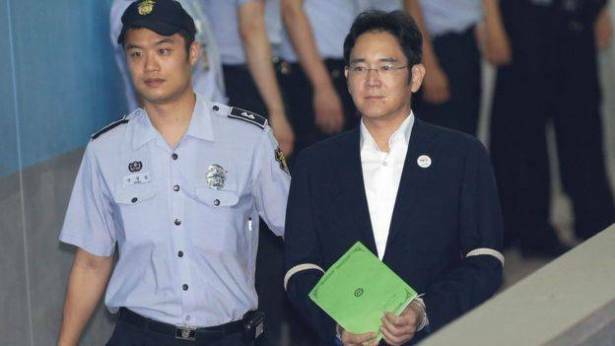 He stands accused of giving donations worth 41bn won ($36m; £29m) to non-profit foundations operated by Choi Soon-sil, a friend of South Korea's former President Park Geun-hye, in return for political favours. The 49-year-old had been standing in as chairman for his ill father, Lee Kun-hee, who suffered a heart attack and slipped into a coma in 2014. Prosecutors alleged that the donations were made to Ms Park's confidante to win government support for a big restructuring of Samsung that would strengthen Mr Lee's control over Samsung Electronics. But the defence said he was not involved in making day-to-day business decisions at South Korea's biggest conglomerate and that the payments were signed off without his knowledge. The charges carry a maximum sentence of 20 years in prison, but he would almost certainly appeal against any conviction. Yet he may yet escape a jail term even if he is convicted. Many top executives of South Korea's biggest companies, including his father, have been convicted of crimes but were pardoned. Mr Lee is the most high-profile figure arrested in the investigation and was charged along with four other Samsung executives. They include former Samsung Group vice-chairman Choi Gee-sung, former president Chang Choong-ki, former Samsung Electronics president Park Sang-jin and executive vice-president Hwang Sung-soo. Three of them resigned after the case emerged but have denied all the charges including bribery and hiding assets. They stand accused of bribing Park to pave the way for the merger of two publicly owned Samsung companies, despite opposition from shareholders. What does it mean for Samsung? The Samsung Group, made up of 60 interlinked companies, is crucial to the South Korean economy, with sales equivalent to about a fifth of the national GDP. The chaebol includes a shipbuilding division, construction company, pharmaceuticals and advertising arms. Other chaebols include LG, Lotte and Hyundai. Mr Lee became a Samsung president in 2009 and in 2013, he was made vice-chairman of Samsung Electronics, which makes smartphones, televisions, cameras and hard drives. But since Mr Lee's father suffered a heart attack in 2014, he has been considered the de facto boss of the entire Samsung group. Regardless of the outcome, the case is likely to damage Mr Lee's reputation as one of the country's most powerful business leaders. However, since his arrest six months ago some of Samsung's business operations seem to have continued largely unaffected. Samsung Electronics posted a record profit of 11tn won for its most recent quarter and the firm has released its new flagship Galaxy S8 smartphone, closing the book on the disastrous recall of the exploding Galaxy Note 7.